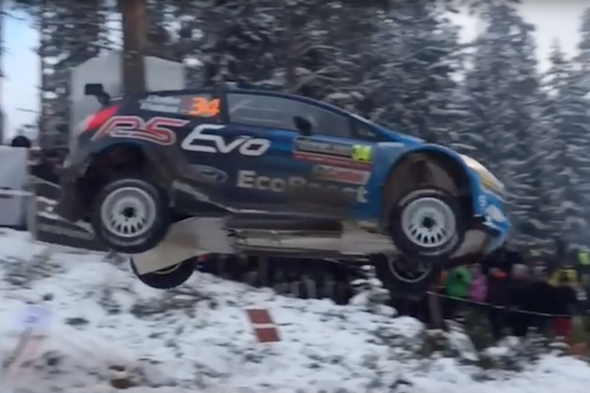 A Norwegian rally driver has set a new record for the longest recorded jump at Colin's Crest on the Vargåsen stage of Rally Sweden after flying 45 metres through the air. At the helm of his Ford Fiesta RS rally car, Eyvind Brynildsen broke the previous record of 44 metres, which was set by Belgian driver Thierry Neuville last year. After deciding to attempt the challenge prior to the rally, which took place from February 11 – 14, Brynildsen took the jump at over 100mph. As a result of the feat, he was awarded the Colin's Crest Award, which is named in honour of the late Colin McRae. Talking to the official WRC website, Brynildsen said: "I heard that Thierry (Neuville) didn't believe the Fiesta R5 could go that fast, but he can join me for a ride if he is unsure! We had a perfect combination of corners before the crest and I knew that we had quite a lot of speed. I decided before the stage that if everything went to plan then I would try to break the record. I just put my right foot on the pedal and held it down. No drama!"